Geology Drift over Underset Limestone. Record Name Bainbridge, Cragdale, Shaw Side and above High lane. Unenclosed settlements and field system. Record Description Undated,enclosed platform settlements near the Sheep Fold on the southern bank of Shaw Gate Gill together with a stone banked field system which may be contemporary with the settlements near the sheepfold. 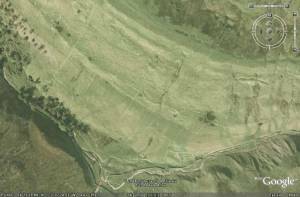 These field banks extends upslope from Shaw Gate Beck to the line of the roman road across the Stake Pass and also across High Lane at around 420m elevation.The settlements below High Lane on Shaw Side were surveyed by Roger Martlew, see Site Information Panel. This field system may also extend further upslope to reach the enclosures associated with an extensive series of enclosures and hut platforms which extend for at least 600m along the outcrop of fell sandstone at 460m. This Upper Settlement complex has not yet been surveyed to my knowledge. Additional Notes The proximity of these settlements to the line of the roman road from Bainbridge to Ilkley is of interest. The agger and ditches of the roman road are very well preserved where the roman road crosses the open hillside above Sikey Gill, south of Shaw Gate.